The largest center of oceanography and marine biology in Europe is to open its doors to the public in Moscow Wednesday. MOSCOW (Sputnik) — The Moskvarium center spans nearly 20,500 square miles and holds 6.6 million gallons of water. “It is the only year-round scientific and educational oceanography center located hundreds of kilometers from the coast,” boasts a message on the Moskvarium website announcing Wednesday’s opening. The Moskvarium, built within record-setting two years, is divided into three zones. In the water-show zone, up to 2,300 visitors may watch orcas, beluga whales, dolphins, walruses and sea lions performances accompanied with 3D projections and 5D effects. The third zone features seven swimming pools where visitors would be able to swim with the dolphins. The Moskvarium is situated on the grounds of the VDNKh exhibition center. Its admission price ranges from $7 for children to $11 for adults. 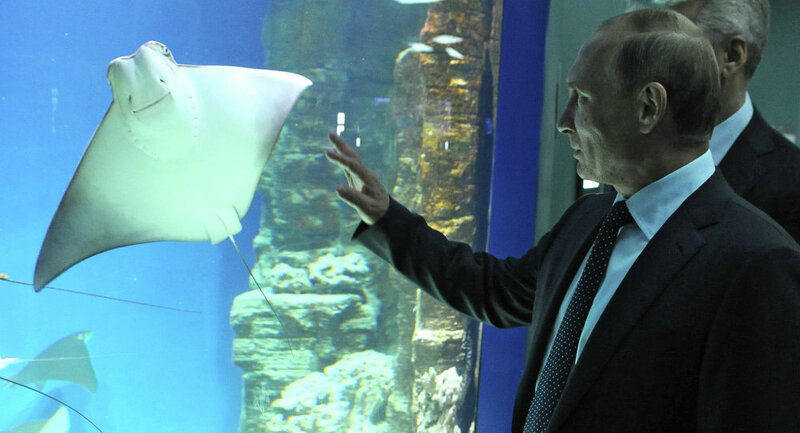 Russian President Vladimir Putin paid the Moskvarium a visit on Tuesday, he observed 80 aquariums with marine and freshwater fauna, among others, from the Galapagos Islands, the Great Barrier Reef and Greenland.